When travelling to Central London you have a choice of places to stay. Many people, of course, choose to stay in a hotel – sometimes because they don’t realise that there is, indeed, a choice, and that is to stay in one of the many Central London apartments for rent. At Carlton Court we offer you a choice of five different apartments that we truly believe cannot be beaten for luxury and the huge range of services that we provide. There is a one-bedroom penthouse for two, a one-bed apartment, two two-bed apartments, and a luxury three bedroom one that can sleep up to six people. Carlton Court is situated just off Piccadilly, and just a few yards around the corner we also have a five-bedroom ambassadorial town house if you need to sleep more than a group of six. The one-bedroom penthouse in Carlton Court has a master bedroom with a king sized bed, a bathroom, reception/dining room, and a fully fitted kitchen complete with a washing machine and tumble dryer in addition to the dishwasher. The second one-bedroom apartment has a spacious living room, a large master bedroom with a very big fitted wardrobe, a full bathroom, and a fully fitted kitchen as with the penthouse. The apartment has its own separate entrance. We also have a two-bedroom duplex which has its’ own entrance on the street and has a large living room, a fully fitted kitchen, and a separate WC. Stairs lead down to what is an extremely large master bedroom with a super king-sized bed, and a second small double bedroom. There is a full bathroom, and there is also a sofa bed in the living room which can accommodate guests. Then there is the two-bed deluxe which has a master bedroom with ensuite bathroom, while the second bedroom has a separate bathroom. 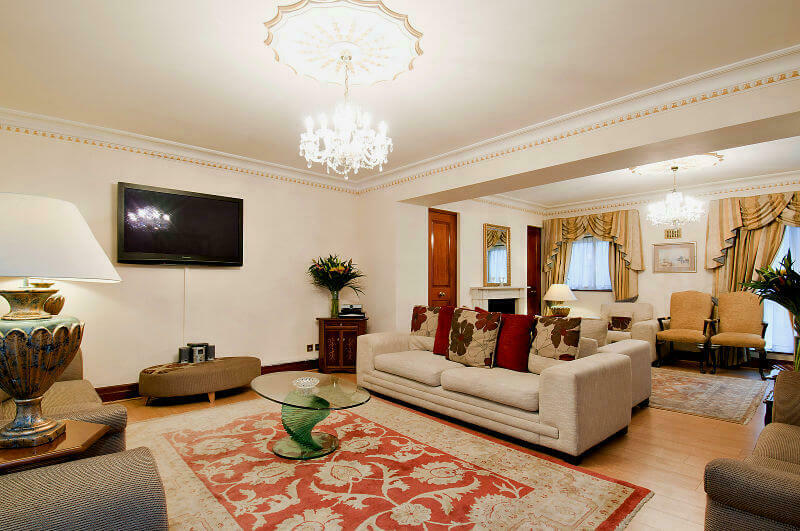 There is a large and spacious reception room and a fully fitted modern kitchen. We also have a three-bedroom apartment which can sleep five or six people. Carlton Court has a 24-hour concierge and security service, along with a 7-day housekeeping and maid service, so you never have to lift a finger when you stay here.